Showing results for tags 'wedding favours'. 3 creamers with cobalt tissue transfers applied through a home made stencil with transparent glaze over. 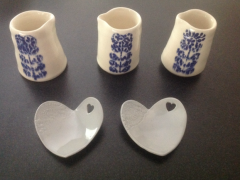 Wedding favours - 2 test pieces (120 in total) glazed with Mayco Stroke and Coat. Individual name tags to be attached using teal ribbon. These are for my niece (a labour of love) - would never be cost effective as a commercial item, unless someone had money to throw away! Fired to 1100oC in electric kiln.